Child-friendly?The Perfect Game is based on the true story of the 1957 Mexican little league team that became the first-ever non-U.S. team to win the Little League World Series. 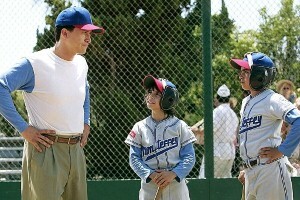 The movie will most likely appeal to fans of other inspiring, feel-good sports movies, such as Rudy or Hoosiers. It is rated PG and contains some themes, like discrimination, that may be difficult for younger movie-goers to understand. It is recommended for kids aged 6 and up. The Perfect Game is the story of a group of poor boys from Monterrey, Mexico, who form a little league team against all odds. Armed with the dream of playing a real little league game, the boys overcome a lack of resources, disapproving parents and widespread prejudice to make their dreams come true. They are guided in their journey by their love of the game, a warm-hearted priest and their coach – an aspiring Major League Baseball Coach who was thwarted by discrimination. The movie follows the team from their beginning in Monterrey to an incredible, record-breaking winning streak that leads them over the U.S. border to Southern Texas. Eventually, they make it all the way to the Little League World Series in Williamsport, Pennsylvania, where a miracle cements their place in history and changes their lives forever. The movie features well-known actors such as Cheech Marin, who plays Father Esteban, and Louis Gossett Jr., who has a small part as an African American groundskeeper that helps the boys decipher their opponent’s hand signals. Coach Cesar is played by Clifton Collins Jr. and the team members include Jake T. Austin, Jansen Panettiere and Moises Arias. While The Perfect Game doesn’t contain any overt violence or vulgar language, there is fighting and racial insults throughout. In addition, parents should know that there are some scenes in which adult characters are shown drinking or drunk. The main theme of the movie is that kids can reach their goals with determination and hard work, even when the odds are stacked against them. Parents can use the film as an opportunity to speak with their children about the discrimination the team faced and how the world has changed since the 1950s.